You can check in Delta Airlines flight in four different ways- through web, mobile, kiosk at the airport and the airport curbside. All of these methods have their own relevance and different timelines of checking in. Passengers can choose either of these methods which is most convenient to them. You can check in online from your computer (by visiting the website of Delta Airlines) within 24 hours before your scheduled flight time. You can also get your boarding passes either printed or have these on mobile as eboarding pass (if the airport at the destination has the facility of scanning the eboarding pass). a) Visit www.delta.com and click on 'Check In'. b) You need to access your itinerary. For this, Delta provides 4 different option. If you known any of these, please enter any one and you will be able to proceed to next step. These four options are: Confirmation Number, Credit Card Number, SkyMiles number or Ticket Number. At this step you can choose number of passengers, effect changes to itinerary, add number of bags, select seats, pay for excess baggage or even upgrade the status of travel. c) Get the boarding pass and this can be printed. However, you also the choice of receiving it in your mobile device. 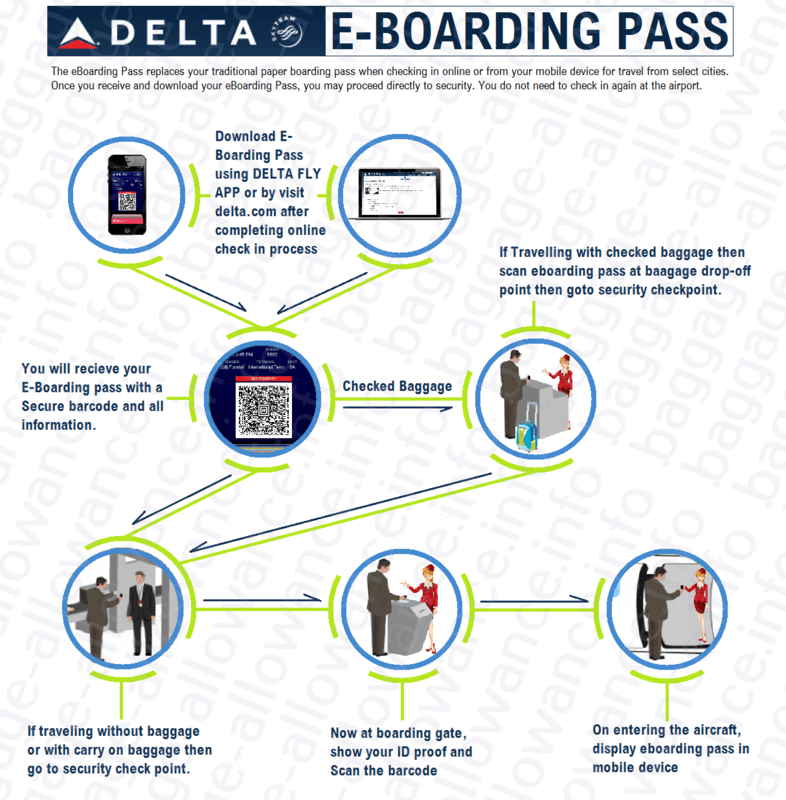 If you are departing from certain destinations (which are mentioned below in the infographic), you do not have to take the print and the mobile boarding pass can be taken to the airport. d) Passengers with checked baggage can leave it at the ' Baggage Drop ' signage at airports. Through the mobile device having internet connectivity, you can check in using the Fly Delta app or simply by going to the delta.com website. Download Available for: iPhone , iPad, Android and Windows phones. Via kiosk, you can check in within 24 hours of the Delta Airlines flight. Kiosk can be accessed in two ways. First option is either by inserting the SkyMiles Card, passport, any credit card having travelers name or scanning barcode on printed Delta Itinerary. Second Option is to select 'TYPE' and enter the confirmation number, SkyMiles number of ticket number. After this is done, you can to check in passengers who are flying with you. Thereafter, Trip Summary can be used to make changes to flights, upgrade seats, check bags, add the Extras and continue with the check in process. Take the printed boarding passes and receipts of records. While using the airport curbside check in facility, which is provided in 100 different US locations, you are required to hand over your check in baggage at the curb of airport. This is one of the most convenient methods of checking in. Delta Airlines also provides that the recommended arrival time at airport is 75 minutes before departure and there is a need for checking in at least 30 minutes before flight. The boarding gates, in general, close 15 minutes before departure. Therefore, you must reach there well in time. 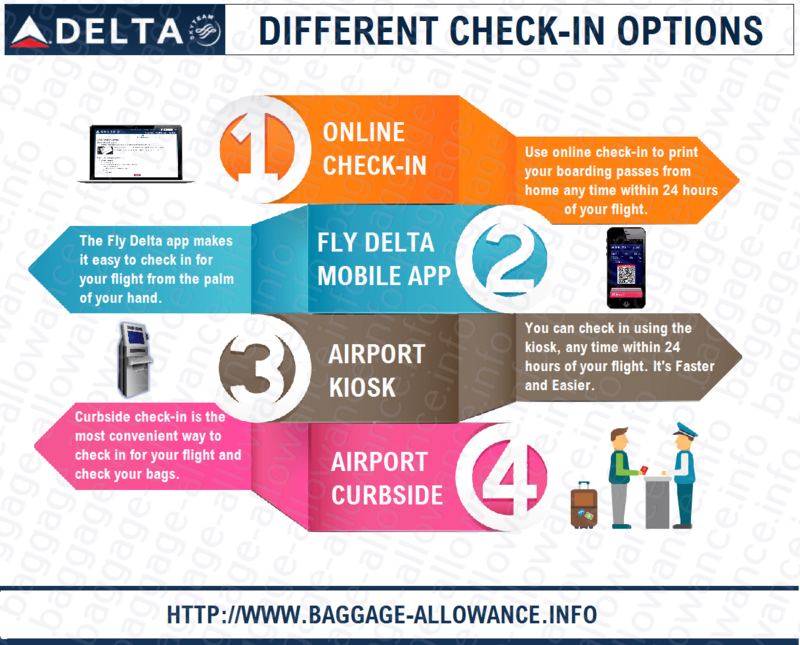 For domestic flights, the minimum check-in times of Delta Airlines for people travelling with or without baggage are provided in this inforgraphic. Similarly, there are different check in and boarding time deadlines for the international destinations. The recommended time of arrival is 3 hours before the flight. It is also important that you check in at least 60 minutes before the departure of flight and shall be present at the gate at least 45 minutes before the departure since the boarding gates close by this time. It is important for all passengers to report within the check in timelines in order to avoid inconvenience.